Cellar holes in the east exist in every state. But those empty holes are more than just vacant depressions in the ground. The empty holes in the east are what remain of the old homes that once proudly stood there. If you love American history, try the adventure of locating these old towns. Everything you need to know on how to locate these old areas can be found on this page. Many hikers, backpackers, and hunters have passed by these areas not knowing what they are, or their history. I believe that these lost towns that dot our eastern states are an important part of American History. And searching for them, is like searching for a lost part of our American heritage. Before I continue to explain how you can search for the ghost towns in the east, it’s important that I mention that I will use the terms “cellar holes” and “ghost towns” interchangeably. You may know of a ghost town near you. Or perhaps, like many others, you are not aware that they exist. You may have driven your car past one of these but you were not aware of it. Much of the information that you will be reading on this page and throughout my website is based on my popular metal detecting, TV series “Ghost Towns Of The East”. 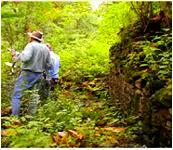 Searching for these old areas is an exciting adventure that can lead to some interesting experiences and treasures. 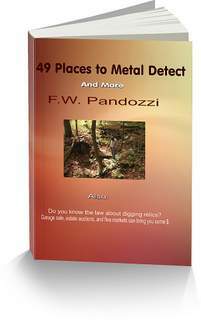 Metal detecting the ghost towns of the east has uncovered some very exciting finds. Whether you are a beginner in the hobby of metal detecting, or one that is experienced, the excitement of finding a relic from hundreds of years ago is one of the best adventures you can explore. And, you don’t need a metal detector to enjoy this adventure. Many times, while just walking through these areas I find pieces of history lying on the ground. These relics have been untouched for hundreds of years. 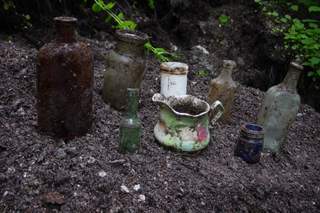 Old bottles and pottery often lay scattered on the ground. 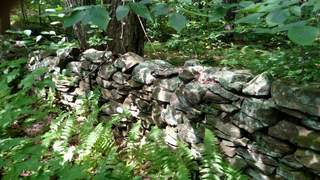 Watch for old stone fences that were used as boundary markers and to keep cattle in inside the property. Before you decide to pick up any item that is on the ground , be sure you are not breaking any law. Often times you can hike, or backpack into remote areas, or just drive the back country roads searching for these ghost towns. Many times I use an old topographical map, or topo for short, to locate them. This page explains how I use a topo to locate the old towns. Watch for old trees, especially maple trees. 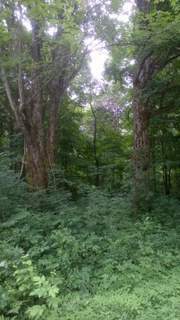 A cellar hole was located thirty yards behind the old trees. Cellar holes in the east exist in every state. My comprehensive ebook to help you locate the eastern ghost towns “Gone But Not Forgotten - Ghost Towns of the Eastern States” is filled with information I have used for almost four decades of searching for these abandoned homes. Thanks for visiting my page. Good luck with your search for those old towns in the east.